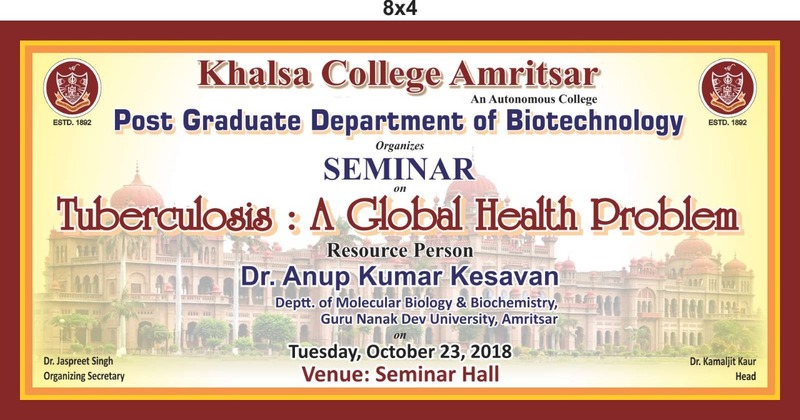 Biotechnological society of Post Graduate Department of Biotechnology, Khalsa College Amritsar organized a one-day seminar on October 23, 2018, at Seminar Hall. Principal Dr. Mehal Singh was the Chief Guest of the function and OSD Prof. Naveen Bawa, on the behalf of Principal Dr. Mehal Singh presided over the function. Dr. Jaspreet Singh, Assistant Professor, P.G. Department of Biotechnology was the organizing secretary and Dr. Anup Kumar Kesavan from the Department of Molecular Biology and Biochemistry, Guru Nanak Dev University, Amritsar was the resource person in the seminar. As a tradition of the college, event started with the College Shabad ‘ਦੇਹ ਸ਼ਿਵਾ ਬਰ ਮੋਹਿ ਇਹੇ...’ recited by the students of Biotechnology Department. In an opening speech, Prof. Naveen Bawa talked about the importance of seminars in the academics and praised the event. Dr. Jaspreet Singh delivered welcome address on the behalf of Biotechnology Department and introduced the resource person by putting a glimpse over his achievements and motivated the students by clarifying that such seminar promote the high standards in quality education. Dr. Anup Kumar delivered an expert lecture on the topic ‘Tuberculosis : A Global Health Problem’. In his lecture, Dr. Anup Kumar also discussed the current scenario of Biotechnology research in India as well as abroad. He listed a number of National and International laboratories involved in the Tuberculosis research. Dr. Jaspreet Singh, Assistant Professor, P.G. Department of Biotechnology presented vote of thanks expressing the gratitude towards the contributors of the seminar. Dr. Jaspreet Singh handled the stage and finally concluded the seminar by thanking the Principal Dr. Mehal Singh, Dr. Kamaljit kaur, Assistant Professor & Head, P.G. Department of Biotechnology, college authorities, teachers, technical staff and student participants for their cooperation that helped in making the seminar successful.